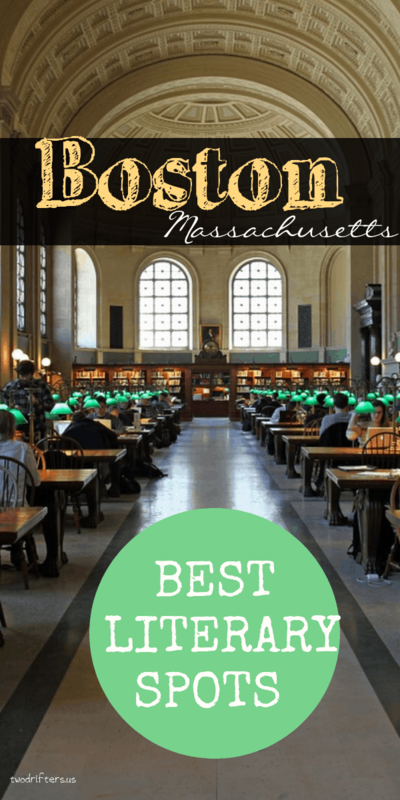 This post on literary Boston is a guest article by Jessica A. Kent of Boston Book Blog. Welcome to Boston, a city rich with writers, readers, and literary culture, both past and present. 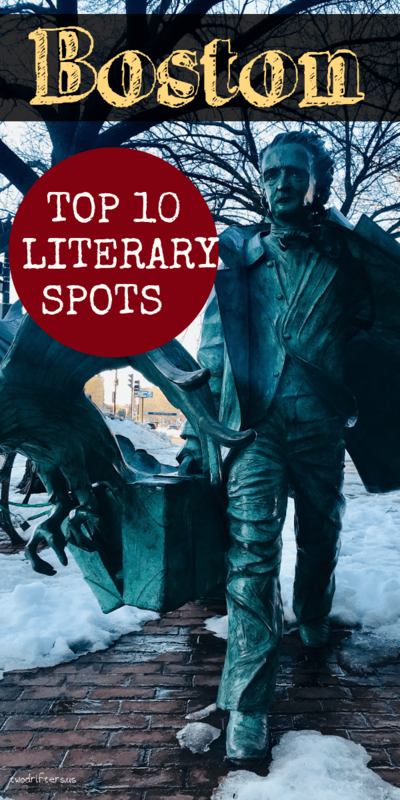 Whether you’re looking to find your next read, be inspired by some bookish sites, or want to learn more about Boston’s literary history, here’s a list of ten not-to-be-missed literary places to visit the next time you’re in Beantown. 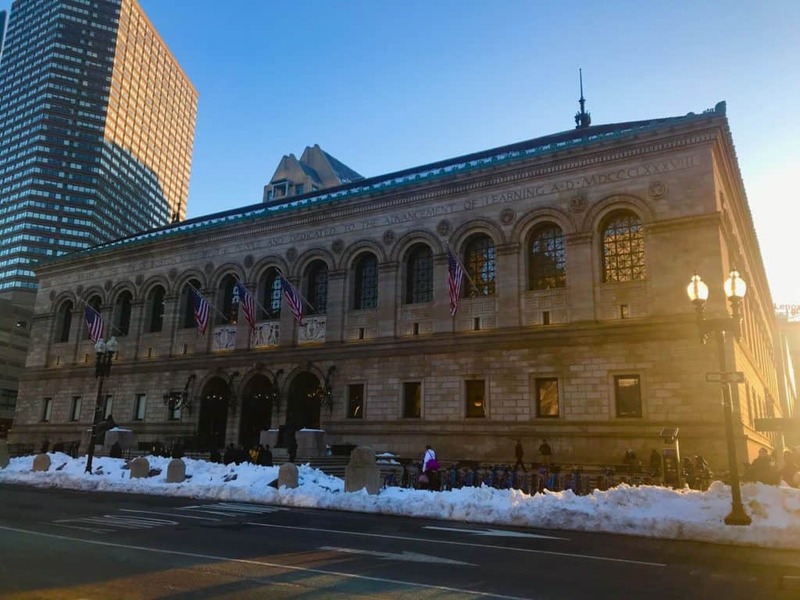 The Boston Public Library was founded in 1848, the first large free municipal library in the country, and today it’s considered to be one of the largest municipal public library systems in America. Start your walkthrough of the space in the McKim Building (the older building facing Copley Square, built in 1895). 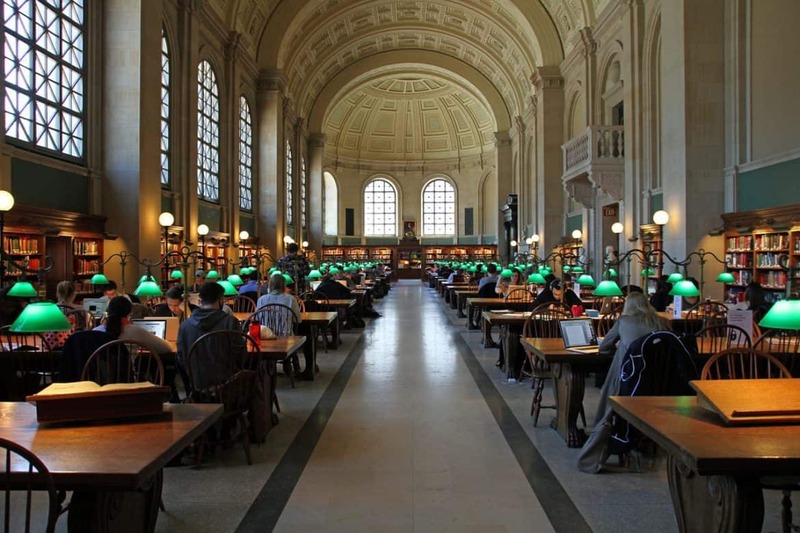 Head up the marble staircase, past the lions, to beautiful Bates Hall reading room, probably the BPL’s most iconic space. Stop into the room next door to see Arthurian legend murals by Edwin Austin Abbey; head upstairs to see a marvelously painted Biblical ceiling by John Singer Sargent. Find your way through the shelves and hallways to the newer building, the Johnston Building. Built in 1972, the Johnston Building recently underwent a massive renovation, turning the once dark and dreary building into a bright space, with comfy chairs, meeting areas, a café, and a welcoming front lobby. Don’t forget to spend some time in the outdoor courtyard with your stack of books, sitting around the fountain. Independent bookstores are at the center of Boston’s literary scene simply by the culture and community they’ve created in the city. Each very different in their own way, you’ll find author readings, panel discussions, book clubs, one-of-a-kind literary events (Reader Prom, anyone? ), and more. Within the city proper you’ll find Trident Booksellers and Café and I AM Books (the nation’s only Italian-American bookstore), and Brattle Books and Commonwealth Books, both specializing in used and antiquarian stock. A short T ride away you’ll find MIT Press Bookstore, Harvard Book Store, and Porter Square Books off the Red Line; off the Green Line you’ll find Brookline Booksmith and Newtonville Books; off the Orange Line you’ll find More Than Words and Papercuts JP. A car or car app can get you to a number more. Do a bookstore crawl yourself to discover their unique atmospheres and offerings, and don’t forget to ask the booksellers for recommendations. Better yet, visit on the last Saturday of April and enjoy Metro Boston Bookstore Day! 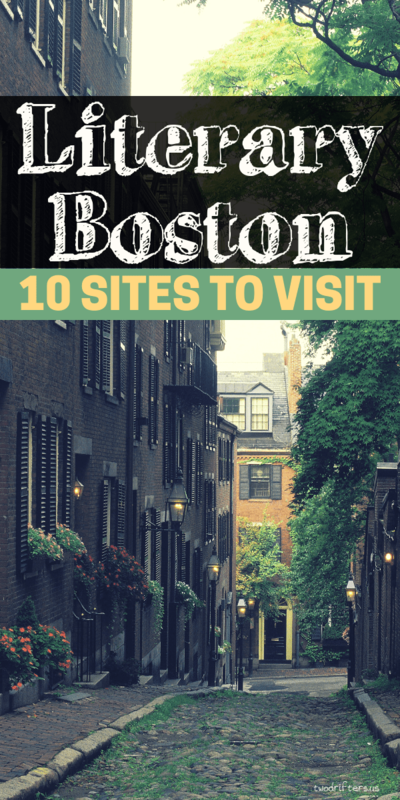 Take a walk around Beacon Hill and discover the historic homes of a vast number of Boston authors. Start on Pickney Street, where at #20 Louisa May Alcott lived with her family as a young girl; she also lived at #43 and #81. Across the street, Elizabeth Peabody, who owned a bookshop on West Street and would hold a literary salon, ran a school for children. A few doors down is #4 Pickney, where Henry David Thoreau once lived. Irish poet Louise Imogen Guiney, friends with literary socialite Annie Adams Fields and writer Sarah Orne Jewett, lived at #16. Over on Mt. Vernon Street you can find the former residence of Henry James, at #131. Poet Robert Frost lived at #88. And just up Willow Street lived Sylvia Plath at #9. These are just a few of the many authors who populated Beacon Hill over the years; if you’d like to learn more, or even trace their steps, there are many tour companies that host walking tours of historic Beacon Hill (Boston By Foot being perhaps the most well-known). 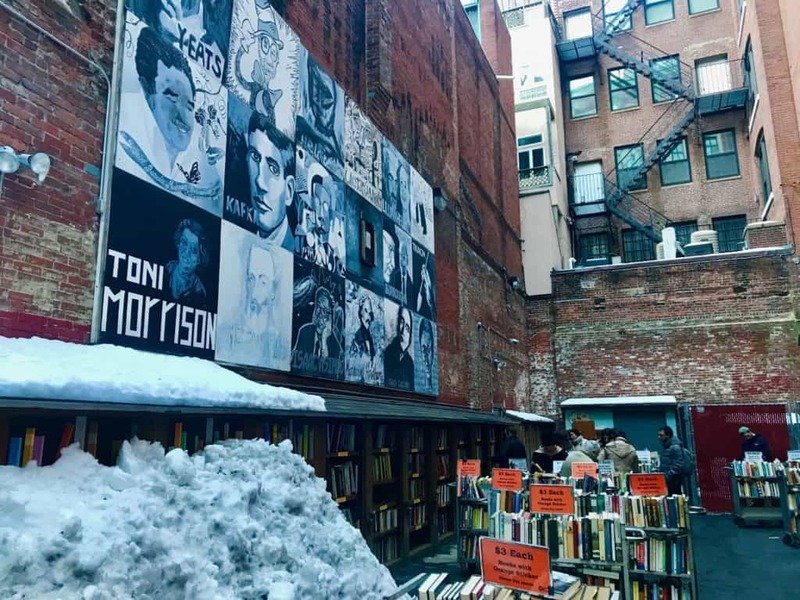 The Brattle Book Shop outside bookstalls, surrounded by murals of authors and book covers, are easily one of the most Instagrammed literary sites in Boston. But the store, which specializes in used and antiquarian books, maps, prints, and ephemera, began back in 1825, originally located a few blocks away where the present Government Center complex is. The store has been in the Gloss family since 1949 when the current owner’s father bought the store. After a 1980 fire burned the store to the ground, the people of Boston donated books to keep the store open. Today, the store is still going strong with three floors of books in which to get lost, and an outdoor sale lot with carts selling books for $1, $3, $5. Take some time to look at the author murals upon the walls above the bookstalls. Curious to learn more about antiquarian books and their market? The owner Ken Gloss hosts a podcast called Brattlecast. 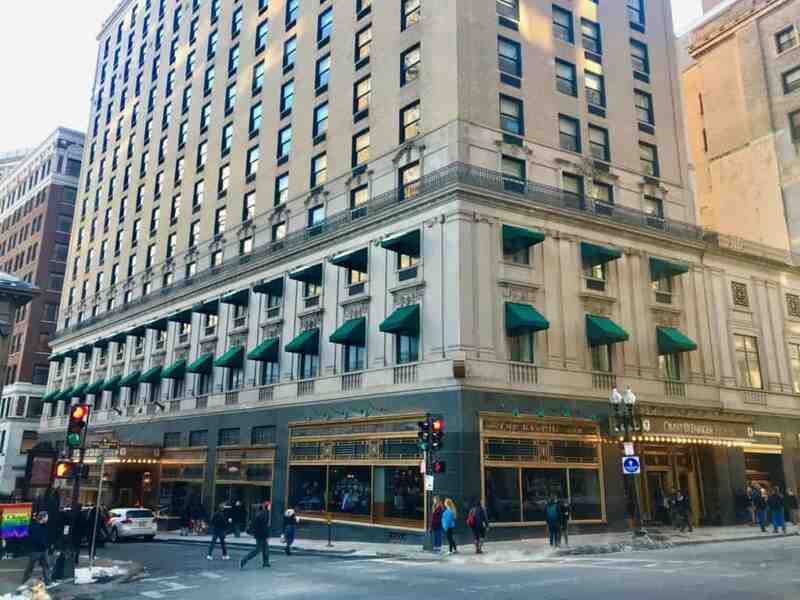 The oldest continuously operating hotel in the country, the Omni Parker House is the place where the original Boston Cream Pie was invented. Enjoy a slice inside knowing that this hotel was once the meeting place of a group of 19th-century writers called the Saturday Club. You can find a blown-up framed sketch of the authors’ table placement in the lobby (note Emerson, Longfellow, Hawthorne…). The Atlantic Monthly was created at one of their meetings as well. Charles Dickens also read A Christmas Carol for the Saturday Club group before premiering it for Boston audiences; a frequenter of the hotel, you can find the “Dickens Door” in the lower level, which was preserved from the room he used to book when in town (look for the annual reading of A Christmas Carol here). Malcolm X was once a busboy here, Mark Twain and Willa Cather spent time here, and even Edith Wharton set a scene of The Age of Innocence here. Today, the hotel’s literary tradition lives on in the School Street Sessions, a take on the old Saturday Club, that meets for public lectures and discussions once a month. 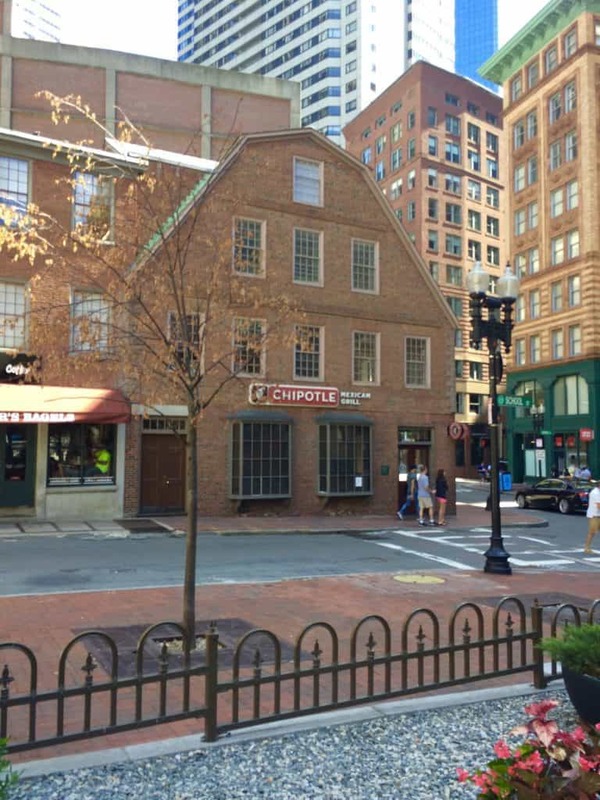 Head to the corner of Charles and Boylston Streets, and you’ll be in the vicinity of the boarding house where Edgar Allan Poe was born in 1809. Though Poe was mostly known for being a Baltimore writer and not a Boston one, he spent some time in the city, including publishing his first poems there, including “The Tell-Tale Heart.” Yet Poe had a contentious (to say the least) relationship with Boston and its writers, famously sparring with Longfellow in print and calling the Boston writers “Frog Pondians.” Still, since he was born here, on the bicentennial of his birth in 2009, Poe Square was dedicated. A statue of the author was unveiled in 2014. The area is a rather literary one as well, with Emerson College and GrubStreet writing center located on the same block. 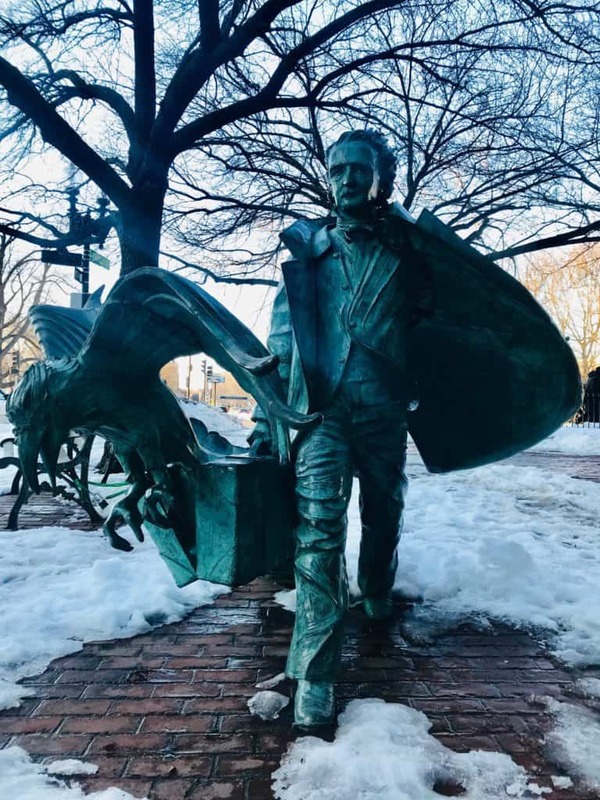 This statue of Poe is one of the great literary landmarks in Boston. Founded in 1807, this private library located behind a set of bright red doors is one of the oldest independent libraries in America. 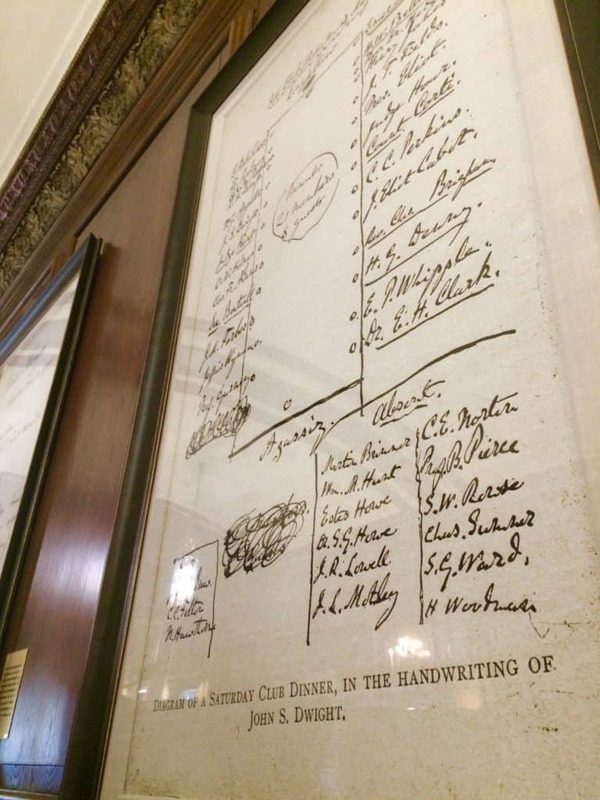 Once a literary hub frequented by Emerson, Hawthorne, Alcott, and others, the Athenaeum is still a vibrant community of patrons and researchers. While it is a member-only library, and visitors only have access to the first floor, time your visit to their annual Fall Open House, where you can browse the floor-to-ceiling bookcases on the library’s five floors, climb metal spiral stairs to the catwalks, sit in lounge chairs and read while overlooking the Granary Burial Ground and Park Street Church, browse the art collections (the Athenaeum once had such an extensive art collection that they donated part of it to start the Museum of Fine Arts), visit part of George Washington’s library, or view their rare books collection. Members enjoy research privileges, book groups, space access, and more, yet most author talks and literary events are open to the public. 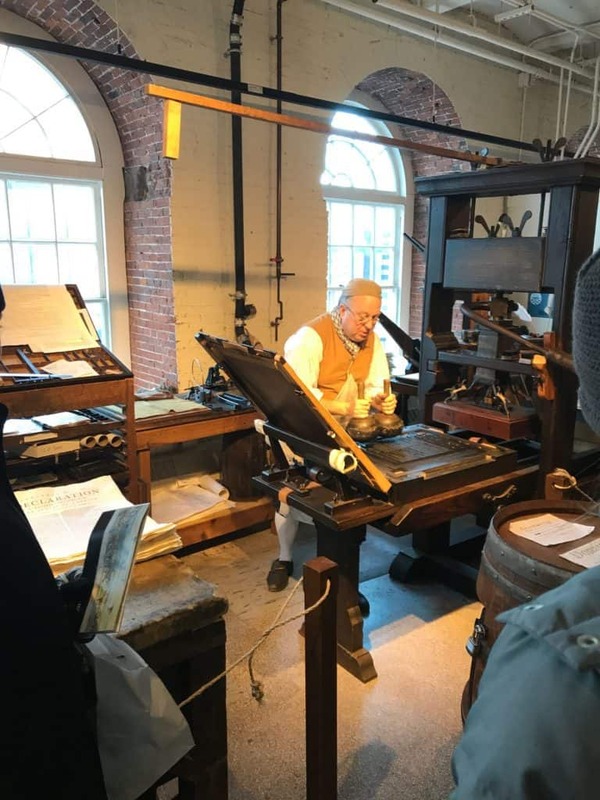 Back in Colonial Boston, the Printing Offices of Edes & Gill were the printers of the Boston Gazette, a newspaper that fueled the American Revolution, and Benjamin Edes himself was one of the Sons of Liberty. Edes & Gill was resurrected in 2010 by Gary Gregory, who bought a Colonial printing press and set up a living history printing shop. Once located next to the Old North Church, Edes & Gill recently relocated to historic Faneuil Hall, where Gregory and his team of living history reenactors give demonstrations on how the printing press works, how to set type, what printing presses were functioning in 18th century America, and the role they played in the Colonies and the Revolution. They will even press out a fresh copy of the Declaration of Independence that you can purchase for $17.76 (get it?). Every October, Copley Square is taken over by the Boston Book Festival, a one-day gathering of authors and readers. 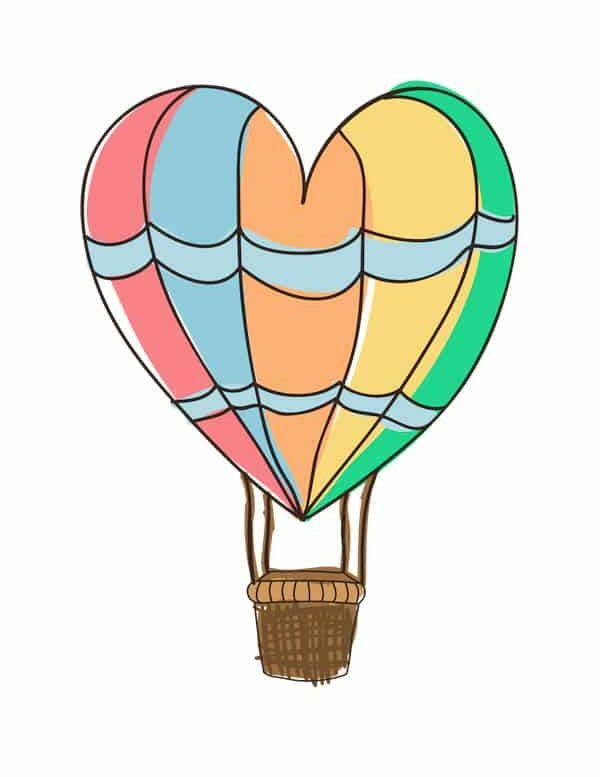 Going into its eleventh year in 2019, the Festival provides a full menu of programming, including author talks and panels on things like historical fiction and memoir, keynote speakers, writing workshops, business and craft sessions, literary games and contests, children’s authors and activities, and more. They also promote One City One Story, where a story is chosen and copies are distributed around Boston, with the intention that the entire city will read a short story together; the author is then invited to a discussion at the Festival. Additionally, there are dozens of local literary vendors set up in Copley Square – publishing houses, literary magazines, literacy centers – and one can browse while listening to live music from Berklee College musicians and snacking on items from the many food trucks. This massive event is free and open to the public. About the Author: Jessica A. Kent is the founder and editor-in-chief of the Boston Book Blog, a website covering the Boston literary scene – both past and present – featuring local event listings, interviews, articles, literary history posts, and more. Follow the Boston Book Blog on Twitter or Instagram as well!